I was supposed to be baptized when I was ten, but my pastor wouldn’t cooperate. I woke up convinced that if I didn’t get dunked tout suite I was bound for hellfire. Ray Price said that, if he were me, he wouldn’t worry about that. If the preacher wasn’t worried about hell, neither was I. So, why did another decade pass before the sacramental deed was done? What happens when the religion (or politics) of childhood no longer feels right? Ideas, especially in the popular realm, are constantly in flux. Although I didn’t know it at the time, the denomination in which I was raised, the tribe that had shaped the way my parents looked at the world, was rapidly evolving. The Baptist Union of Western Canada (as it was then called) viewed itself as a bridge between the liberal United Church of Canada and the tangle of evangelical denominations that were too conservative to desire communication with the United Church or the Anglicans. That was changing. By the early 1970s, the explosive post-war growth of mainstream Canadian religion was over. The United Church was on the defensive, the evangelicals were on the march, and the BUWC was increasingly inclined tempted to join the born-again parade. I was uncomfortable with kind of strident “saving the world for Jesus” rhetoric. Since I grew up Baptist, this may surprise you, but I had never heard this kind of language before. Missionaries were always visiting the churches of my youth, typically dressed up in native Bolivian, Kenyan or East Indian costumes. But they rarely used conversionist language. The missionaries told us about the wonderful, but impoverished, churches they were working with in far off lands and challenged us to share the wealth with our less fortunate brothers and sisters. The missionary musical was preaching a different message. We have the gospel; the heathen are dying in sin and ignorance; and God wants us to save them. I shared my concerns with my pastor, Richard Darling. He was from Texas, so he knew all about revivalism and save-the-heathen missions. But he was already encouraging me to attend the Southern Baptist Theological Seminary in Louisville Kentucky. Darling graduated from Southern in the early 1960s, and the experience had broadened his horizons considerably. The notion of eternal damnation was pretty much assumed in my religious subculture, but no one ever talked about it, preached about it or, most importantly, sang about it. You were supposed to believe it; but it was considered bad form to bring it up. It was around this time that Richard Sherbaniuk, my old school friend (and a religious skeptic), asked me if I thought he was going to hell when he died. The question caught me off guard. “No Richard,” I told him, “I don’t think you’re going to hell.” The thought of God consigning Richard, or anyone else, to eternal conscious torment struck me as ludicrous. What kind of God would do such a thing? In my religious subculture, baptism was vaguely associated with getting saved. And if you asked us what we were saved from we would have looked at the floor and mumbled something about eternal separation from God. Eternal separation was like hell, but it didn’t hurt so much. It was often said that being eternally separated from God would be much worse than being roasted over a slow fire, but nobody really believed that. Baptism was a pretty rare event in my experience. Every year, five or six children would submit to the rite, and there was the occasional young man accepting the consequences of marrying a Baptist girl who cared more about religion than he did. But the preachers of my youth didn’t do altar calls and our churches didn’t sing twenty verses of Just as I Am in the unlikely event that some sin-sick soul was “under conviction” and on the verge of breaking. So, what did hinder me? I guess I wasn’t sure I met the qualifications. Candidates for baptism were supposed to testify to a conversion experience of some kind. No one ever said this from the pulpit, and Canadian Baptists didn’t like to brag about their exotic religious experiences, but you there was supposed to be some kind of darkness-to-light transformation. And that sort of things was foreign to my experience. The sermons I grew up on were full of references to the heroes of the faith like Martin Luther, John Wesley, and Billy Graham who wrestled with despair and doubt before finally surrendering to God. 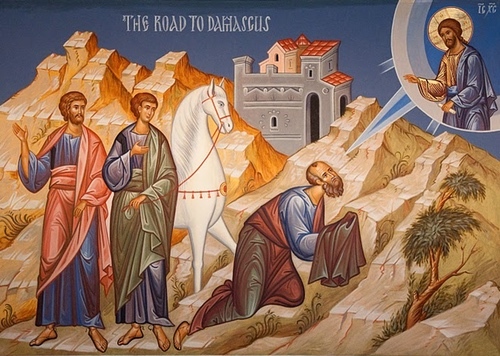 And behind all these stories lay the greatest conversion story of them all, the literal “Damascus Road Experience”. If the Apostle Paul was anything to go by, the Christian faith should be glorious, mystical and life-transforming. And there were all those hymns. “I once was lost but now am found; was blind but now I see.” Fanny J. Crosby talked about it all the time. I wasn’t sure what these lyrics were about, but it was alien to my experience. These lyrics will never be mistaken for great poetry (the “soul-whole” thing betrays the copy-cat nature of the genre), but they did create an air of expectation that I didn’t meet. I have met plenty of people (most of them women) who can testify to profound religious experience; but I cannot. Like most of the Christians I knew, I had imbibed the language of Zion with my mother’s milk. We had never wandered into the “far country” with the prodigal son. We had sins to repent, to be sure, but they consisted, almost exclusively, of impure thoughts that rarely translated into action. We felt lots of guilt, but little woman-at-the-well despair. Most people adapt to religious culture without much reflection. If baptism is the done thing, you get baptized. But I was the son of Muriel and Gordon Bean and that meant reflecting endless wrestling with all things religious. I was raised to be that way, and I will die that way. It’s my birth-rite. Gordon and Muriel Bean experienced a joint mid-life religious crisis in their fifties because they took their religion so seriously. Surely, they told themselves, there was more to being a Christian than the bland social rhythms of McLaurin Baptist Church. Gordon and Muriel found the answer in the charismatic movement. In the late 1960s, they were baptized in the Holy Spirit, spoke in tongues, and never looked back. But the elder Beans never relinquished their membership at McLaurin and kept showing up for worship as long as they were physically able. For one thing, they knew and loved their church friends (even if they weren’t “spirit-filled”). More importantly, they experienced a stability at McLaurin that wasn’t always evident among their charismatic friends. I would know I had received the baptism when I spoke in tongues. But that wouldn’t happen until I sincerely opened myself to the Holy Spirit. I tried. I really did. Nothing happened. More to the point, I knew nothing was likely to happen because I didn’t want to speak in tongues. I didn’t want to hang out with the kind of people I encountered at the meetings my parents dragged me to. This stuff worked for my parents; it didn’t work for me. If God wanted to zap me, I would accept my fate; but it wasn’t something I was hungering and thirsting for. If John Wesley felt his heart “strangely warmed” at Aldersgate, and if Fanny J. Crosby had visions of rapture bursting on her sight, I was happy for them; but I was beginning to fear (or hope) that I wasn’t cut out for that sort of thing. But I wanted very much to be a Christian. In the Gospels, Jesus just walked up to people and said, “follow me.” And they followed. That’s what I was looking for. And then Richard Darling, our pastor, announced that Carlos Gruber, a Latvian preacher-violinist, would be holding a week of revival services at our church. I wasn’t sure what to make of that. I had seen my share of movies from the Billy Graham Evangelistic Association, so I was familiar with the drill. We would sing a bunch of hymns, the preacher would preach, an altar call would be issued, and people would stream forward to “accept Jesus”. A little Googling reveals that Carlos Gruber fled his native Latvia with 2,000 other Latvian Christians when a fascist dictator came to power in 1933. The refugees settled first in Brazil where his father died, and then moved to the United States in 1937. Gruber attended Southwestern Seminary in Fort Worth and eventually ended up in the East Texas town Nacogdoches where his wife was an English professor at Stephen F. Austin University. Gruber retained a thick Latvian accent. My mother suspected that he was laying it on for effect and complained that she missed every other word he spoke. He played the violin with great fervor but little precision. But Carlos Gruber had a testimony. He had accepted Jesus at the age of 11 and he wanted sinners everywhere to share his experience. He wanted that very badly. Just how badly became particularly clear when the Latvian violinist addressed the children’s department of our Sunday school. I was on hand as the newly installed teacher of the Junior High boys class. When no one responded to his initial altar call, the evangelist’s face flushed red, his voice grew louder, and his accent became so exaggerated that we had no earthly idea what he was talking about. When that didn’t work, the preacher dropped to his knees, lifted his Bible into the air in a dramatic flourish, and began imploring God to save at least one soul that morning. Finally, with not a single convert to show for his efforts, Carlos Gruber began to weep and a trickle of children made their way to the front. I was neither impressed nor convicted by Carlos Gruber’s preaching. There was much about him to admire, but all I saw was a strange old man with a violin. Nothing he said stuck with me. And yet, on the last Sunday of the Carlos Gruber revival, I walked the aisle and, shortly thereafter, I was baptized. I didn’t get baptized to save my soul or to make my parents happy; I got baptized because, although I had never had a conversion experience or a Holy Ghost baptism, I had decided to follow Jesus. It wasn’t about escaping hell, or even about laying my burden of sin at the cross; it was about becoming a disciple of Jesus. That which I greatly feared had at last come upon me. In the Trinity Term of 1929 I gave in, and admitted that God was God, and knelt and prayed: perhaps, that night, the most dejected and reluctant convert in all England. If someone had asked me if I wanted to follow the teaching of Jesus, I would have jumped at the chance, even when I was ten years old. But no one ever put it that way. It was always about being “born again”, about “being saved,” about being “washed in the blood of the lamb”. Only late in life have I been able to tentatively embrace this kind of language. A year after my baptism, I was still teaching the junior high boys when the Rev. Dr. Carlos Gruber returned for an encore performance. The Sunday he was scheduled to address the opening assembly, I went directly to my classroom and waited for the kids to arrive. No way I was going to sit through a repeat of last year. “Well, how’d it go?” I asked my charges as they filtered into the room in bewilderment. “What about you guys,” I asked. I have often wondered why Carlos Gruber resorted to such bizarre theatrics. Maybe it was because the trauma of his early life cast refracted the world into light and shadow. But there was another reason. The Latvian evangelist was thoroughly immersed in a Texas Baptist culture in which high pressure child evangelism was the norm. Evangelists use statistics to sell their services and Carlos wanted to report a rich harvest of souls. Pastor Darling asked me to speak to some the children who came forward in the course of the second Gruber revival. Three or four had been thinking about getting baptized and the revival gave them an opportunity to get ‘er done. But the vast majority of the kids just wanted to embarrassing spectacle to stop. The man was really sad, and walking to the front of the room made him happy. Baptist life in Texas was far more dramatic than the bland evangelicalism of my childhood. While Canadian Baptists struggled for survival, Texas Baptists were busy shaping a culture, and aggressive child evangelism was central to the program. Looking back, I thank God for Canadian Baptist blandness. The only practical alternative to American-style revivalism was the loose liberalism of the United Church. Unhappy with either option, we just focused on loving Jesus and being kind to one another. And that was okay until people started asking the kind of hard questions our churches couldn’t talk about. That will be the burden of my next installment. Glad to hear your experience was similar to mine. When I taught our senior high youth at Wednesday night Bible study, I made sure that I shared with them that I never had a “mountain top” experience and probably never will – but that doesn’t mean I’m not a Christian and it is not a measure of the depth of your Christianity. Your reflections have added to my understanding of McLaurin specifically and BUWC life in general. Looking forward to your next installment!